We are working on a new feature that will make it easier for you to manage your clients’ accounts on GrowthWheel Online. Under the “Team” menu you will find a new column where you can see the status of your client: invited, not invited, or not logged in yet. If your client hasn’t logged in yet, you can re-invite your client. 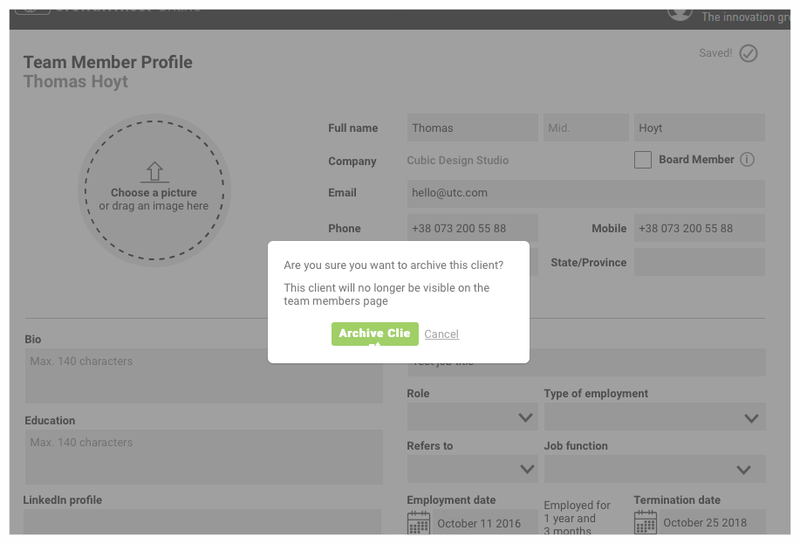 If you no longer wish that your client has access to the company profile you can archive your client. In the “Team” menu you can now see for all clients if they have been invited or not, and you can choose to re-invite a client if he or she didn’t log in. 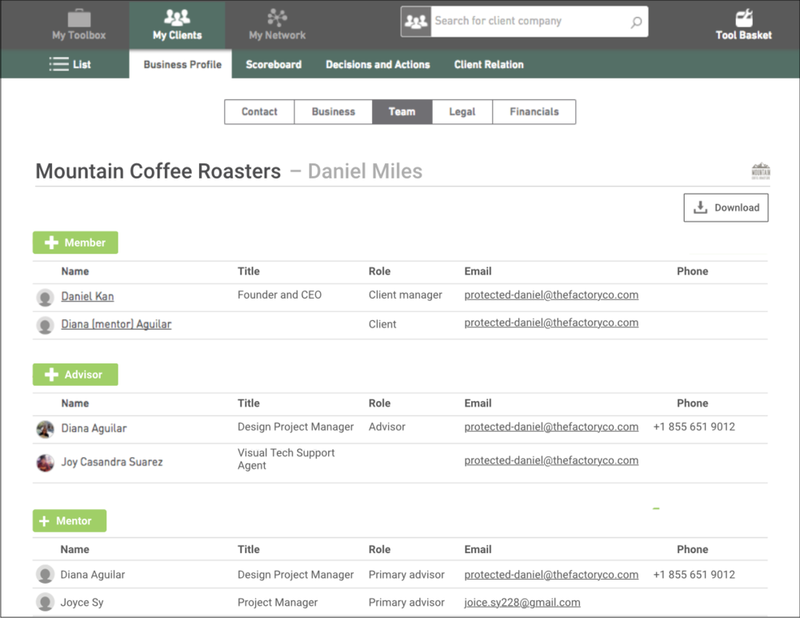 You can now add more detailed information about every client, such as responsibilities, professional and personal skills, and notes, or you can manage user settings. If you no longer want a client to be visible on the team members page, you can now archive that client. In addition to the Business Profile, you will soon be able to add even more information about your client companies thanks to our new Financials menu that is currently in development. Financials will help you produce a financial summary of your client’s business, and is essential to assess a company’s progress and growth. You will also be able to download all the data you add to Financials as a complete, visual PDF report. Please note that the Financials menu is not a finished product yet: the ideas and mock-ups in this post are still in progress. Get an overview of your revenue by adding information about the revenue per quarters and revenue by year. In the revenue breakdown, you will be able to add information about revenue per product/service and revenue per market/channel. Using the cost structure, you will be able to keep track of all direct costs and all operational costs, divided into different cost categories. Get an overview of all employees by adding information about the employee count by quarter and by year. 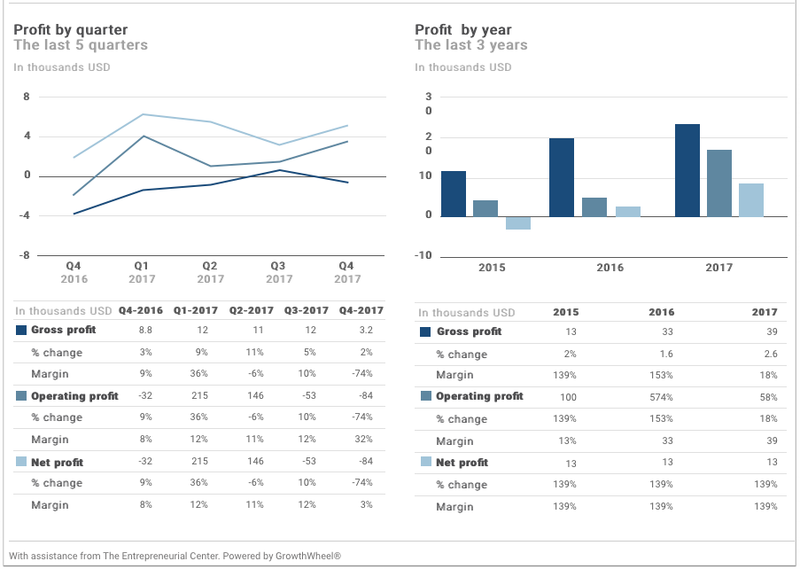 List gross profit, operating profit and net profit by quarter and by year. The balance sheet is a composition of Assets and Liabilities. By adding records to one category, the same numbers will be added to the other to remain balance. Add information about received funds such as loans or investments, by quarter or by year. In the investment catalogue, you will be able to create an overview of your total investments, total return, and accumulated cash flow. 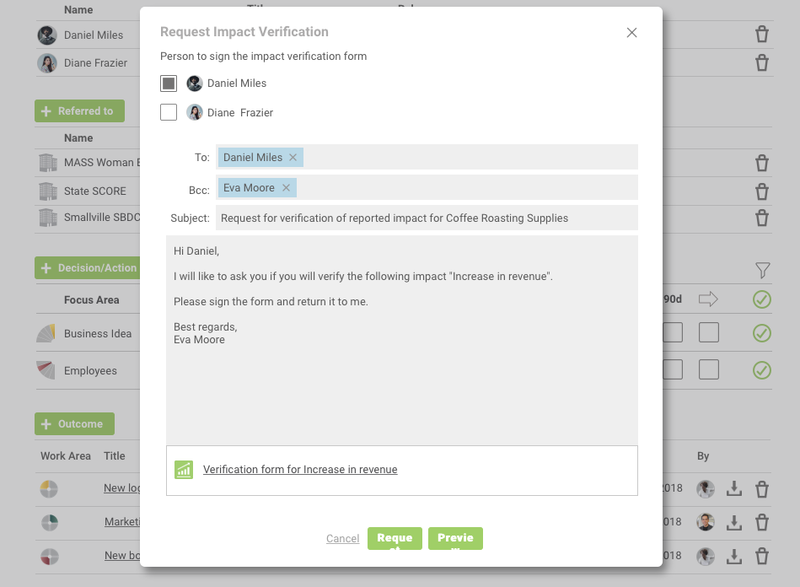 Produce a Revenue Forecast per product or per market. Add numbers to the product forecast by quarter or for the next three years. 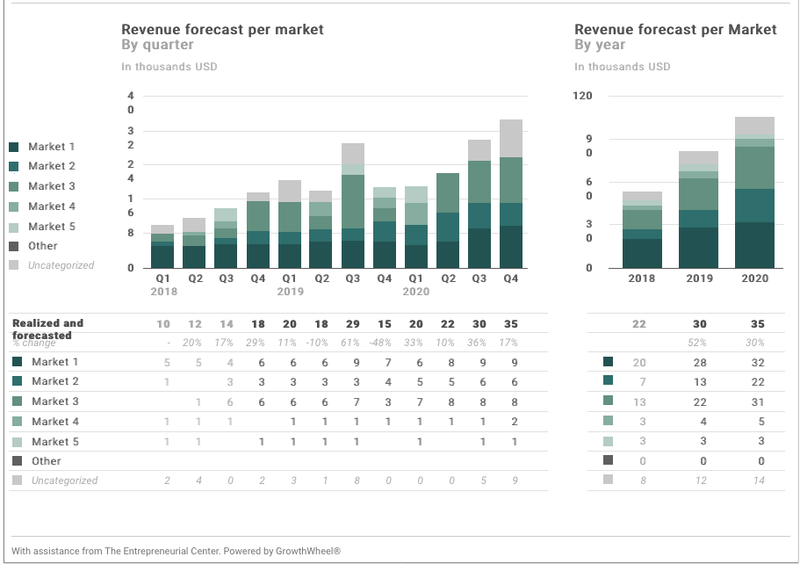 The Revenue Forecast helps you decide what products or markets are going to drive growth. Add numbers to the market forecast by quarter or for the next three years. Ideas or suggestions? Please share your comment below, and take part in the development of the upcoming menu. With our new menu “Services”, advisors will be able to create and schedule events for courses, workshops, or other types of training in their center. This feature will give you many new possibilities. When creating a new event, detailed information can be added to each training ranging from topic, language, partners, instructor, duration, and much more. Starting with the List page, advisors create templates of programs. This is followed by customizing and scheduling the events on the calendar page. Once the event is over, it will become visible on the History page, where advisors can add the participants. Finally, statistics are available for all created programs. All the information added within “Services” can be downloaded as PDF files. Using this page, business advisors and their clients can stay informed about every event that is happening within your organization. The list tab gives you an overview of all created events and their details. Stay updated on who joined what events in the past, what topics have been addressed, and much more. Get a visual overview on the number of trainings, participants, type of events, and top 10 instructors within the analytics page. 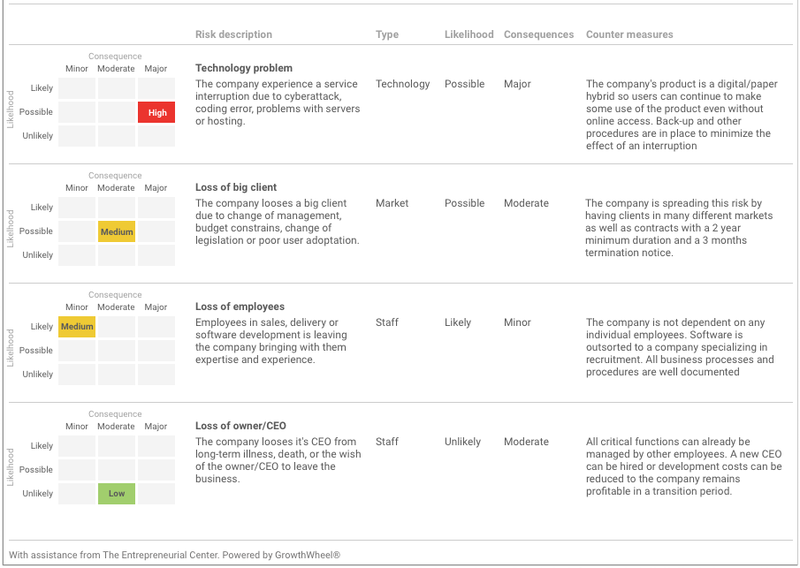 We're working on a Balance Sheet page to be a part of the Business Profile. This is an add-on to the financial pages we already have for revenue and profit. 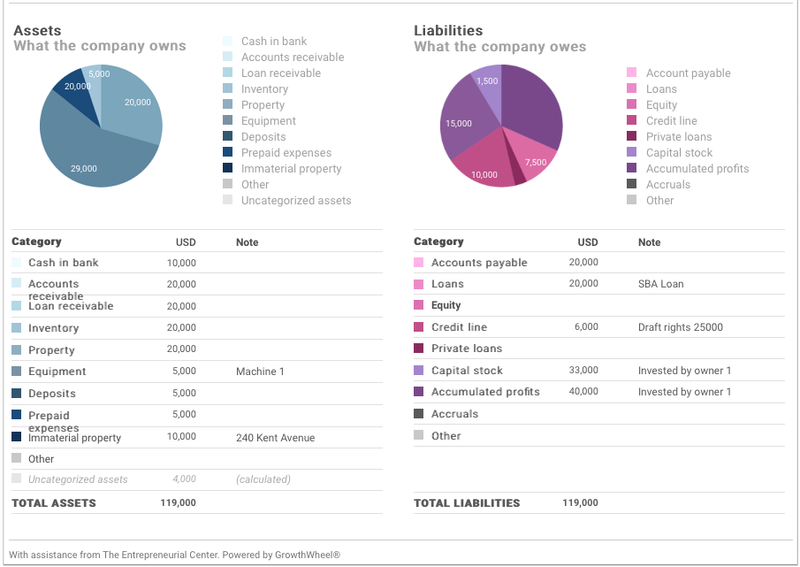 The Balance Sheet will be simple and visual, taking up one page and include a chart to showcase the distribution of assets and liabilities. It will contain categories so it's easy to create, even for clients who lack fluency in accounting. The Balance Sheet will also be 'smart' in the way that Total Assets will always be equal to Total Liabilities. When an asset is added automatically, an uncategorized liability will be added to make the balance sheet stabilize until a liability is added to provide a specification. We hope this upcoming page will make the Business Profile even more useful as a supplement to the lending applications for clients. Please share your comments below, and take part in the development of the upcoming page. We want to provide you the best product possible, but it takes a good idea, so please send us your suggestions via the GrowthWheel Suggestion Form and become a GrowthWheel Co-creator.